Sea Breeze - Sassy cover-up / gauze dress that travels and dances in the breeze! MADE IN USA. A light weight, breezy, carefree crinkle cotton fun dress for those crazy entertaining days! Fluffy and cool Kaftan dress or cover-up with open V-neck, 2" ruffles everywhere, carefree crinkle cotton. Slip it on over your bathing suit if you like, or enjoy it as a hostess dress for a patio party. Side seams extend from arm hole to just above knees. So go ahead and kick up your heels! One size fits most. (sizes 8 >18). Falls to knee length, depending on your height. All wonderful colors for your summer's fun. 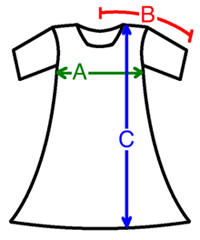 A: Chest / Bust circumference 64"
B: Sleeve length from center of neck to end of sleeve 19"
C: Body length from shoulder to bottom of hem 41"
Glad to see this back this year! I live in these during the heat of summer and am excited to get one in a new color. Thank you! I already have two of these and need more for my vacation on Maui. I'm so glad to see you are getting more in.